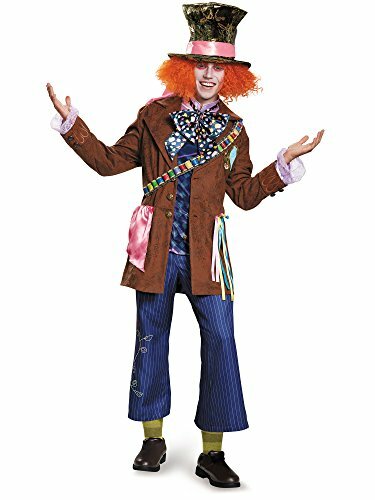 Mad Hatter costume, based on Tim Burton's movie. Features a jacket with applique patch with metallic thread embroidery, a top with character-accurate printed details and button trim, pants with embroidered print, a thread spool sash, a separate cravat with character print and a hat with metallic print, flocking, fabric sash and faux peacock feather. It’s time to go mad once again in this stunning mad hatter ultra prestige costume Features a removable jacket with working buttons, applique patch with metallic thread embroidery, top with character-accurate printed details and button trim, pants with embroidered print, sculpted three-dimensional thread spool sash, separate cravat with character print and the mad hatter’s signature hat with metallic print, flocking, fabric sash and faux peacock feather. 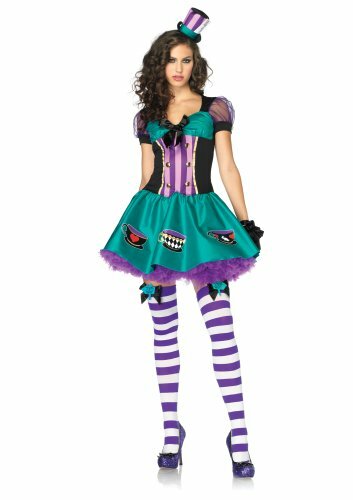 This Mad Hattress costume has cute teacups on the dress and includes a headband with small top hat.